Interested candidates can fill the application for Nursing Courses on or before 22nd March 2019. Candidates can check the complete details of the Nursing Courses like application process, eligibility criteria and other information on the page below. The purpose of the course is to assist students become a professional nurse committed to the promotion of health, prevention of diseases, and care during illness and rehabilitation of the clients. The Candidate must have passed the B.Sc. (Hons.) Nursing Examination (12+4) years of the University of Delhi or a Degree recognized as equivalent thereto with at least 55% marks in the total. Candidates must have gained at least one year experience in Nursing in a Hospital/Specialty Institute/Educational Institution or Public Health/Agency. The experience will be calculated up to the 23rd March Candidate from 11+4 years Nursing Degree Program will require a minimum of Two years� experience in Nursing. No Correspondence/Telephonic information in this connection will be entertained. The test will be of two hours and thirty minutes (21/2 hrs) duration and shall contain objective type questions. The test will be based on B.Sc. Nursing Syllabus prescribed by I.N.C. �All Candidates are required to report one hour before the commencement of the test. Prescribed application forms with prospectus for the Session 2019-20 can be obtained from R.A.K. 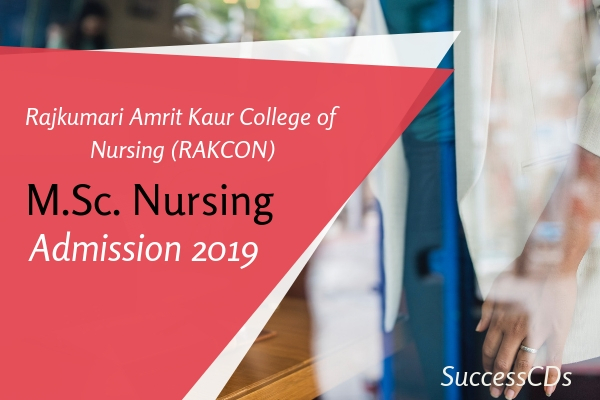 College of Nursing, Lajpat Nagar, New Delhi-110024 on payment of Rs.550/- by Demand Draft addressed to Principal, Rajkumari Amrit Kaur College of Nursing. Students should apply on the prescribe application forms issued by the College for the Session 2019-20; application Forms of Previous Years Will Not Be Entertained.